Excalibur Banner Stands. Perfect for exhibition stand use. Stylish design and proven reliability make the Excalibur a popular banner stand. Now with integrated Ipad or small lcd screen mounting. IPad or lcd screen not included. Excalibur Banner Stand with integrated Ipad display. 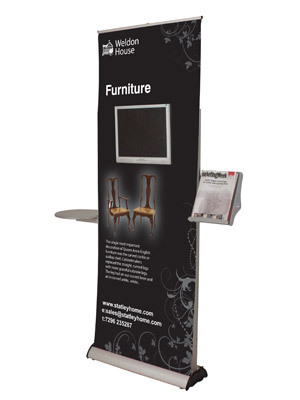 The Excalibur banner stand is a stylish design and sturdy enough to have an Ipad integrated into the graphic.. This roll-up banner stand is a very popular premium banner specially designed to take an Ipad or a LCD screen weighing upto 5kg. patented A frame with Ipad or LCD screen holder. The Barracuda roller banner stand is the leading premium display stand on UK market. The BV Banner Stand is the best value banner stand to be found in the UK market.